I know I have not posted in what amounts to an epoch in blogging terms. I'm working on a post about the whys of my absence. It's a bit convoluted to explain in a post that deals with unicorns. Work is back to being phenomenally busy. There was a break in February and March, but, since March 18th, it's been a steady stream. That's good for bottom lines, but not good for observational blog posting. I am, however, posting tonight because this makes me smile. We are involved in a very large redevelopment in the city. Part of the project was inspections; 52 of them to be exact. I wasn't involved in the bulk of the project. I picked up the slack for smaller, far-flung jobs, but I did do 8 of them. My last day of inspections involved a condo building used by DePaul University to house graduate students. In the first apartment, there was this piece on the wall. I was struck by the coolness factor. The gal from the management company said as long as I took a photo just of the head, she didn't see any harm in my photographing it so I could find something like it later. 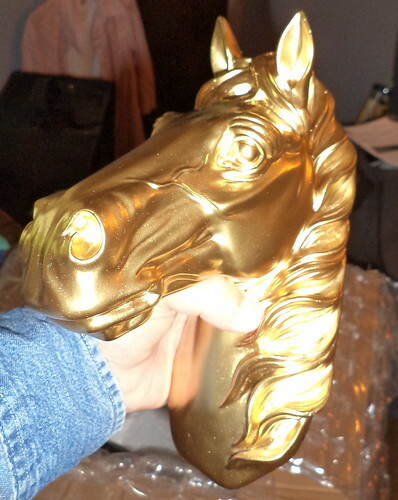 How does one find a golden unicorn head? 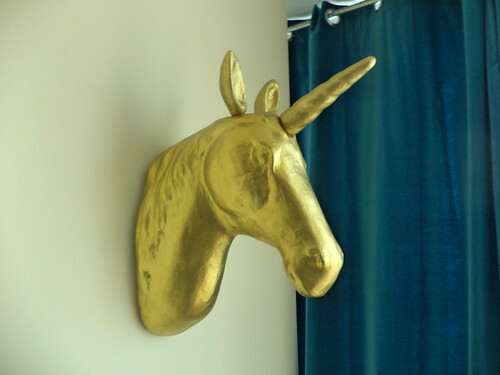 Well, one types "golden unicorn head" into Google and up pops an etsy shop belonging to White Faux Taxidermy. Now, you go to that shop and tell me you aren't amazed and excited. Unicorn heads come in two sizes. Did I want a large size or a small size? I looked around my house. I guess I should decide where to put the thing, if I was going to buy one. I'm still tidying. It's an ongoing process, but part of that extends to the art I have on my walls. Some things mean a great deal to me. Other things have passed their excitement. I found a piece I got from someone who no longer is a friend. I never found out why she quit talking to me. That spot would be perfect for a small unicorn head. When UPS pulled up outside, I knew what they were delivering. 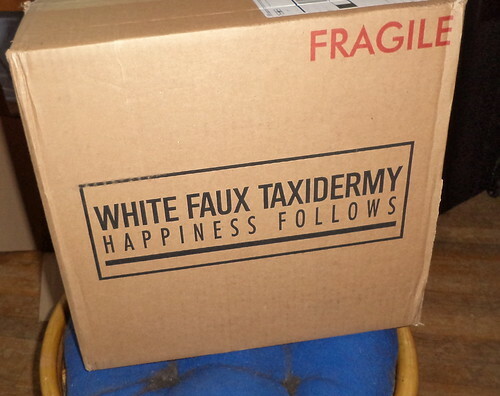 It's a rather large box. For a moment, I wondered if it would be too big for the allotted space. It comes "unassembled", meaning the horn is in the styrofoam packaging with the head. You simply have to insert it into the hole in the top. You can see this is not all that big. The mini-unicorn is 10 inches tall while the regular size is 16.25 inches tall. Now to hang it. 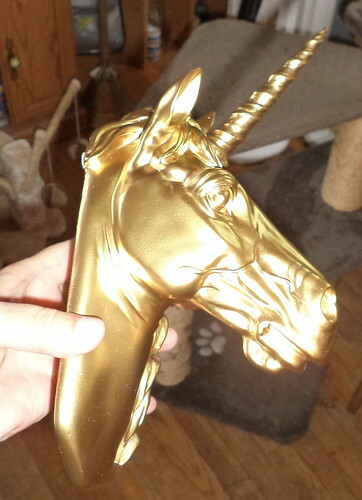 I removed the piece of art, a rectangular item 8.5 by 11 inches, and put the unicorn in its place. The bigger head would not have fit in the space. I would have had to rearrange the photos above and below it. As it is, my photos are sorely in need of a removal and dusting behind and around them. My next purchase is going to be a shark's head for the bathroom. It is only one size, but I can get it in a whole bunch of colors. Step 1 is to paint the room. Step 2 is to hang the whale shelf. Only then can I save up for a shark head. Look! 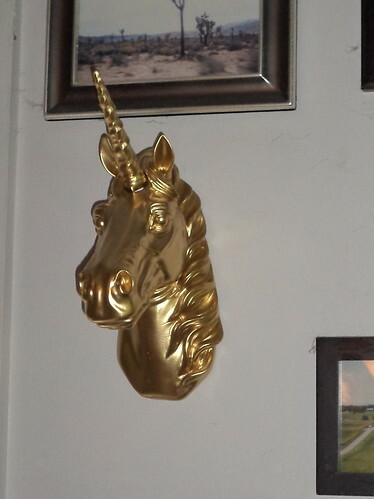 I have a golden unicorn head on my living room wall! Is this not the coolest thing? Any objections to life that you have for the next week are irrelevant.